The Juicing Book: A Complete Guide to the Juicing of Fruits and Vegetable for Maximum Health and Vitality. For centuries, the world's greatest civilizations have known about the importance of fresh juice derived from fruits and vegetables. They have used juices to retain health, restore vigor, and overcome illness. Only in the last thirty years, with the advent of refined commercial juices, has the value of juices declined. Relegated to the status of soft drinks, the majority of bottled and canned juices available today offer very little benefit to the consumer. Now, Stephen Blauer, co-author of The Macrobiotic Way, has written this informative and lively book telling people just how important fresh juices can be. 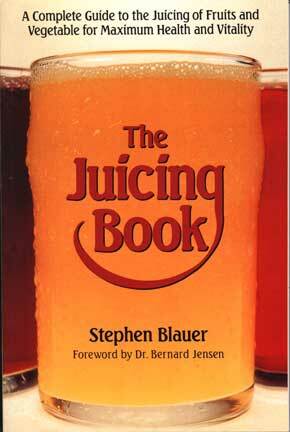 The Juicing Book is the complete guide to using juices to maximize your health and vitality. The author offers up-to-date information on the value of juices in relationship to your body's needs;explains the difference between commercially grown crops and organically grown produce; and provides easy-to-follow techniques for ridding fruits and vegetables of herbicides and pesticides. Also included are delicious recipes, comprehensive charts, and detailed instructions on using various jucing equipment. The Juicing Book shows you just how you can get the most nutritional value from apples to zucchini--and practically everything in-between. 164 pages.